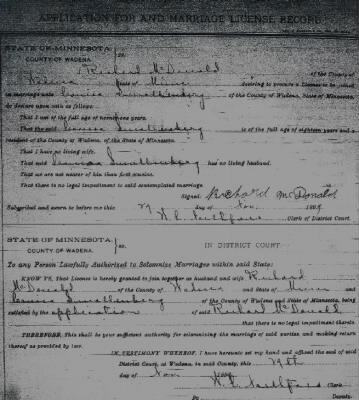 Wadena County, MN, marriage license for Richard McDonald and Louise Smallenberg, 29 November 1899. Attached are three copies (afterward scanned) of the U.S. Federal census in Washington State (1920, 1910, and 1900) showing the family of Richard Jacob McDonald, to whom was born Louisa [Cecelia] McDonald, shown as the fourth child, 15 years old (as of 1 January 1920, when the 1920 census was begun). This Louisa Cecelia McDonald is my great-grandmother. The census was taken in Monroe, Snohomish County, Washington state. On the census, the first location given is the place the individual was born; the second is where the father was born; and the third is where the mother was born. This, then, indicates that she was born in Washington state, while her dad was born in Minnesota, her mom in Wisconsin. Age, known information about the states where parents were born, etc., verifies that this should be the right family. With her parents thus established as Richard Jacob McDonald and Louisa McDonald, I am ready to follow the line further back. Louisa indicates that her family comes from Wisconsin, so the goal is to verify this information through various sources. One of the easiest ways to see if this is the correct general direction is through the census. The 1910 census lists Louisa (the mother) as approximately 30 years old, so she would have been born in 1879 or 1880, depending on in what month her birth actually took place. In looking at a marriage certificate for Richard and Louisa, I find that her maiden name was listed as Schmalenberg. Because this is a German name, it's likely American census-takers would not have understood how to spell it correctly. I start with a broad search using Soundex, for the surname "Schmahlenberg" (S545) in Wisconsin. I actually find one "Schmahlenbarry, J." in the 1880 census (Hickory Grove, Grant County, Wisconsin). He has a daughter, Louesa, who is 7/12 years old (which is, of course, 7 months old). (This follows the pattern of incorrectly spelling the name found in the 1910 census, coincidentally.) Given that Louisa lists that she was born in October (see the 1900 census image, attached to Phase One, above) and that the 1880 census was begun on 1 June 1880, these are very likely to be the same individual. It makes sense that she was born in October or November of 1879, and since they didn't record how many days within a given month on the census, October is not a stretch. This is a good beginning, but I now need to verify this with some primary sources, like a birth certificate. Initial searches have been unsuccessful, but I continue to investigate this line for further information. Rather than methods I've been using so far, perhaps concentrating first on grave stones might prove helpful. Comparison shows that this is the same family, with the name of Louisa (the mother) misspelled (as "Louise") in the 1910 census. This suggests this is also a misspelling for the daughter in 1910, especially when compared to later documents. Via a book index, it appears this could be listed as either Jacob or Joseph Schallenberger in "History of Grant County, Wisconsin" (1881), page 1025. I will update this entry when I have looked in "History" myself.